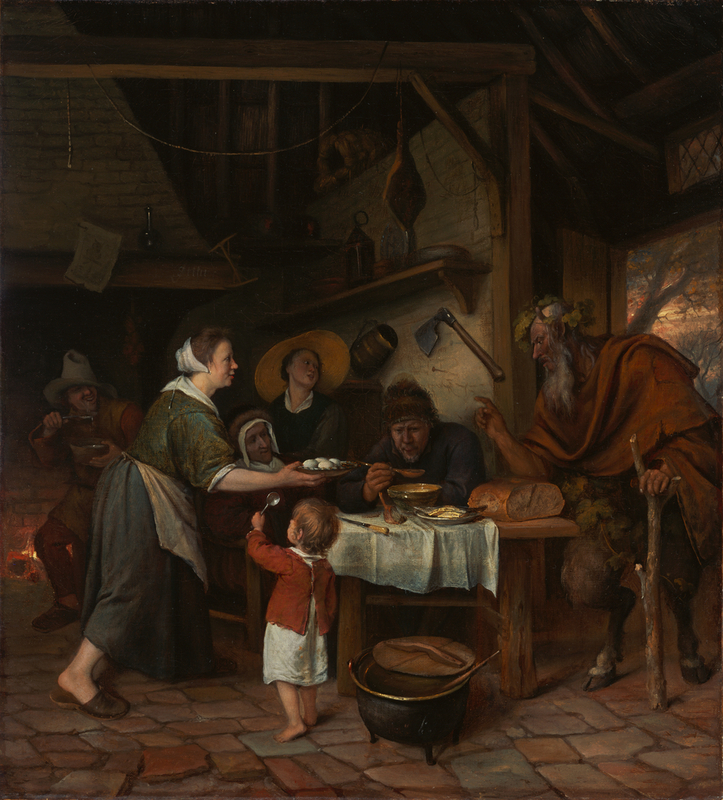 A peasant family sits around a wooden table in a Dutch kitchen. The room's exposed rafters, assorted domestic objects on shelves, and cobbled floor are all rendered in careful detail. A woman serves a man who blows on his soup to cool it. A young child faces her, holding a spoon in his upraised hand and begging for food. A lively young woman wearing a large straw hat and an old woman fill the space between the eating man and the standing woman. A crude fellow in the background spoons soup into his grinning mouth. Next to the open door, a satyr leans on a staff and points an admonishing finger at the peasant family. The satyr has noticed that the peasant blows both on his hands to warm them and on his soup to cool it. He will turn to leave the house because he cannot trust someone who blows "both hot and cold with the same breath." The artist Jan Steen painted this subject, known originally from Aesop's Fables, many times. Throughout the 1600s, this moralistic tale was a popular subject for Dutch and Flemish painters. Source: Christie's, London. Catalogue of the Choice Collection of Ancient & Annotated auction catalog GRI: Modern Pictures, including Many of High Class, the Property of George Blamire, Esq., Deceased [...]. November 7, 9, 1863 p. 10, lot 63. Walter Childe Alers Hankey, 1839 - 1921 (Beaulieu, Hastings, Sussex, England), sold to Martin H. Colnaghi (among a group of old master paintings) before January 1899. Source: Exhibited at the Royal Academy 1885, no. 124. Martin H. Colnaghi, 1821 - 1908 (London, England), sold to Charles Sedelmeyer (with at least 16 other Hankey paintings) in January 1899. Source: Ripps 2010, p. 36. Charles Sedelmeyer, 1837 - 1925 (Paris, France), sold to Cornelius Wilhelm Heyl in February 1899 for 8,000 marks. Source: Sedelmeyer 1899, no. 50 (RKD annotation). Cornelius Wilhelm Heyl, Freiherr von Heyl zu Herrnsheim, 1843 - 1923 (Worms, Germany), returned to Sedelmeyer in February 1899 for 7,500 marks. Charles Sedelmeyer, 1837 - 1925 (Paris, France), sold to Franz M.A. Philippson in April 1899 for 8,000 francs. Franz M.A. Philippson, 1851 - 1929 (Brussels, Belgium; Château de Seneffe, Seneffe, Belgium), by inheritance to his son, Moritz Philippson, 1929. Moritz Philippson, 1877 - 1938 (Brussels, Belgium; Château de Seneffe, Seneffe, Belgium), probably by inheritance to his son, Paul Philippson, 1938. Source: 1935 Brussels exhibition, no. 777 (M. Philipson [sic]). Probably Paul Philippson, 1910 - 1978 (Brussels, Belgium; Château de Seneffe, Belgium), looted by the Nazis, probably in 1940. Source: Répertoire d'oeuvres d'art dont la Belgique a été spoliée durant la guerre 1939-45 (1948), no. 243, as looted from Philippson collection. Fritz Rothmann (London, England), sold to W. E. Duits, Ltd., October 15, 1941. W. E. Duits, Ltd. (London, England), sold to John Enrico Fattorini, January 30, 1942. Source: Duits Gallery Records, Getty Research Institute, Special Collections, Acc. No. 860290. Painting assigned inv. no. 7434 in 1941/42 (index cards, Box 36). See Boxes 7 (194-ledger, p. 1, right) and 22 (stockbook). John Enrico Fattorini, 1878 - 1949 (Bradford, Wiltshire, England), by gift to his daughter, Agnes Elizabeth (Fattorini) Roach, by 1945. Source: Liverpool exh. cat. 1944, no. 18. Agnes Elizabeth (Fattorini) Roach, 1908 - 1995, sold to W. E. Duits, Ltd., November 2, 1945. W. E. Duits, Ltd. (London, England), sold to Martin B. Asscher, February 28, 1946. Source: Duits Gallery Records, Getty Research Institute, Special Collections, Acc. No. 860290, inv. no. 7699 (1945/46), Box 21, Stockbook no. 73, p. 83. Source: Slatter exh. cat. 1947, no. 22. Julius Böhler Gallery (Munich, Germany), sold to the J. Paul Getty Museum, 1969. Wenley, Robert, Nina Cahill and Rosalie van Gulick, Pride and Persecution: Jan Steen's Old Testament Scenes (Birmingham: The Barber Institute of Fine Arts, 2017), p. 15, fig. 6. A. Paillet and H. Delaroche, Paris. i Catalogue de tableaux, formant une réunion imposante d'Articles [...]. January 25, 1802, pp. 93-94, lot 163. Paillet, Laneuville. Catalogue d'une collection precieuse de tableaux des trois ecoles, composant le cabinet de M. de S [...]. January 22-24, 1812, p. 28, lot 47. Christie's, London. A Catalogue of a Highly Distinguished and Very Celebrated Collection of Italian, Flemish, and Dutch Pictures, the Genuine Property of his Grace, the Duke de D'Alberg [...]. June 13-14, 1817, p. 9, lot 58. Lacoste and Henry, Paris. Catalogue de tableaux précieux des diverses ecoles [...] formant le cabinet [...] Féréol Bonnemaison [...]. April 2-7, 1827, p. 54, lot 75. Smith, John. A Catalogue Raisonné of the Works of the Most Eminent Dutch, Flemish, and French Painters [...]. 9 vols. (London: Smith and Son, 1829-42), vol. 4 (1833), p. 22, no. 71. Barbé, Brussels. Catalogue d'une belle collection de tableaux des écoles flamande, hollandaise, italienne, et française [...]. May 1, 1837, p. 110, lot 621. Christie's, London. Catalogue of the Beautiful Collection of Pictures of the Very Highest Class, of William Williams Hope, Esq., Partly from Rushton Hall, Northamptonshire [...]. June 14-16, 1849, p. 28, lot 108. Westrheene, Tobias van. Jan Steen: Étude sur l'art en Hollande (The Hague: Martinus Nijhoff, 1856), p. 159, no. 359. Christie's, London. Catalogue of the Choice Collection of Ancient & Modern Pictures, including Many of High Class, the Property of George Blamire, Esq., Deceased [...]. November 7, 9, 1863, p. 10, lot 63. Exhibition of Works by the Old Masters, and by Deceased Masters of the British School: Winter Exhibition, Sixteenth Year, exh. cat. (London: Royal Academy of Arts, 1885), p. 27, no. 124. Sedelmeyer Gallery. Illustrated Catalogue of the Fifth Series of 100 Paintings by Old Masters of the Dutch, Flemish, Italian, French and English Schools [...] (Paris: Chas. Sedelmeyer, 1899), p. 60, no. 50. Hofstede de Groot, Cornelis. Beschreibendes und kritisches Verzeichnis der Werke der hervorragendsten holländischen Maler des XVII. Jahrhunderts. 10 vols. (Esslingen a. N.: Paul Neff Verlag, 1907-28), vol. 1 (1907), p. 20, no. 79. Hofstede de Groot, Cornelis. A Catalogue Raisonné of the Works of the Most Eminent Dutch Painters of the Seventeenth Century, Based on the Works of John Smith. Edward G. Hawke, ed. and trans. (London: Macmillan and Co., 1908-27), vol. 2 (1909), p. 29, no. 79. Exposition d'art ancien: Cinq siecles d'art a Bruxelles, exh. cat. (Brussels: Exposition Universelle et Internationale, 1935), unpaginated, no. 777, ill.
Exhibition of Works by Dutch Masters of the Seventeenth Century, exh. cat. (Liverpool: Liverpool City School of Art, 1944), unpaginated, no. 18, ill.
1947 Exhibition of Dutch and Flemish Masters, exh. cat. (London: Eugene Slatter), unpaginated, no. 22. "Forthcoming Sales." The Burlington Magazine 90, no. 549(December 1948), p. 364. Office de Récupération Économique. Répertoire d'Oeuvres d'art don't la Belgique a été spoliée durant la guerre 1939-1945 (Brussels: Royaume de Belgique, 1948), no. 243. Sotheby's, London. Catalogue of an Important Collection of Choice Paintings by English and Continental Masters. The Property of the late Sir Bernard Eckstein, Bt. December 8, 1948, p. 9, lot 25. Greig, T.P. "In the Auction Rooms." Connoisseur 123-24 (March 1949), pp. 63-66, ill.
Wellensieck, Hertha. "Abendliches Arkadien: Ausstellung Böhler, Munchen." Weltkunst 37, no. 21 (November 1, 1967), p. 1096, ill.
Gemälde Alter Meister des 17. und 18. Jahrhunderts, exh. cat. (Munich: Julius Böhler, 1967), pp. 11, no. 23, fig. 3. Fredericksen, Burton B. Catalogue of the Paintings in the J. Paul Getty Museum (Malibu: J. Paul Getty Museum, 1972), no. 114, pp. 86-87. The J. Paul Getty Collection, exh. cat. (Minneapolis: Minneapolis Institute of Arts, 1972), unpaginated, no. 49, ill.
"The Great Search." Apollo 96, no. 129 (November 1972), pp. 448-49, ill.
Fredericksen, Burton B., ed. The J. Paul Getty Museum: Greek and Roman Antiquities, Western European Paintings, French Decorative Arts of the Eighteenth Century (Malibu: J. Paul Getty Museum, 1975), pp. 71, 121, ill.
Fredericksen, Burton B., et al. Guidebook: The J. Paul Getty Museum. 3rd ed. (Malibu: J. Paul Getty Museum, 1976), p. 58. Fredericksen, Burton B., Jiří Frel, and Gillian Wilson. Guidebook: The J. Paul Getty Museum. 4th ed. Sandra Morgan, ed. (Malibu: J. Paul Getty Museum, 1978), p. 75. Mosby, Dewey F., ed. Cinco siglos de obras maestras de la pintura en collecciones norteamericanas cedidas en préstamo a Costa Rica, exh. cat. (San Jose: Museo de Jade, Instituto de Seguros, 1978), pp. 64-65, no. 20, ill.
Braun, Karel. Alle tot nu toe bekende schilderijen van Jan Steen (Rotterdam: Lekturama, 1980), pp. 102-3, 180, ill.
Fredericksen, Burton B. Masterpieces of Painting in the J. Paul Getty Museum (Malibu: J. Paul Getty Museum, 1980), unpaginated, no. 39, ill.
Fredericksen, Burton B., Jiří Frel, and Gillian Wilson. The J. Paul Getty Museum Guidebook. 5th ed. (Malibu: J. Paul Getty Museum, 1980), pp. 56-57, ill.
Walsh, John. Jan Steen: The Drawing Lesson (Los Angeles: Getty Museum Studies on Art, 1996), pp. 15-16, fig 11. Jaffé, David. Summary Catalogue of European Paintings in the J. Paul Getty Museum (Los Angeles: J. Paul Getty Museum, 1997), p. 121, ill.
Westermann, Mariët. The Amusements of Jan Steen: Comic Painting in the Seventeenth Century (Zwolle: Waanders, 1997), pp. 279, 307n10. "LA's Getty Museum has Painting Looted in Nazi-Era." Reuters (March 23, 2000). Cloutier-Blazzard, K. "The Wise Man has Two Tongues: Images of the 'Satyr and Peasant' by Jordaens and Steen." In Myth in History: History in Myth. Society for Netherlandic History Third Annual Conference Proceedings, Willem Frijhoff and Laura Cruz, eds. (Leiden, Koninklijke Brill N.V.: 2009), pp. 100-104, fig. 4. Ripps, Michael J. "Bond Street Picture Dealers and the International Trade in Dutch Old Masters, 1882-1914." Ph.D. diss. (University of Oxford, 2010), p. 36. Lissarrague, François. Le Cité des Satyres: Une Anthropologie Ludique (Paris: Éditions de l'École des Hautes Études en Sciences Sociales, 2013), p. 15, fig. 4. White, Christopher. Review of Jan Steen. The Hague. Burlington Magazine 160, no. 1382 (May 2018), p. 414. Suchtelen, Ariane van, ed. Jan Steen’s Histories, exh. cat. (The Hague: Mauritshuis, with Waanders, 2018), pp. 158-64, 183-84, no. 19, ill., entry by Ariane van Suchtelen.